Franco (illness) is back in the lineup for Wednesday's game against the Marlins, Jim Salisbury of CSN Philadelphia reports. Franco was scratched earlier in the week with an illness, but apparently he's feeling closer to 100 percent as he's set to return against right-hander Dan Straily. 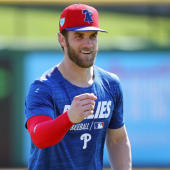 The 24-year-old has been in a major funk at the plate, slashing just .205/.264/.313 in May, and the Phillies have reportedly discussed sending Franco to the minors if he doesn't get right in a hurry.